This sunny Caribbean coastline in Mexico is one of the top vacation spots of the entire country. With its idealistic, white sand beaches, stunning coral reef, vibrant nightlife and laid back beach towns, this is the perfect place to escape to. 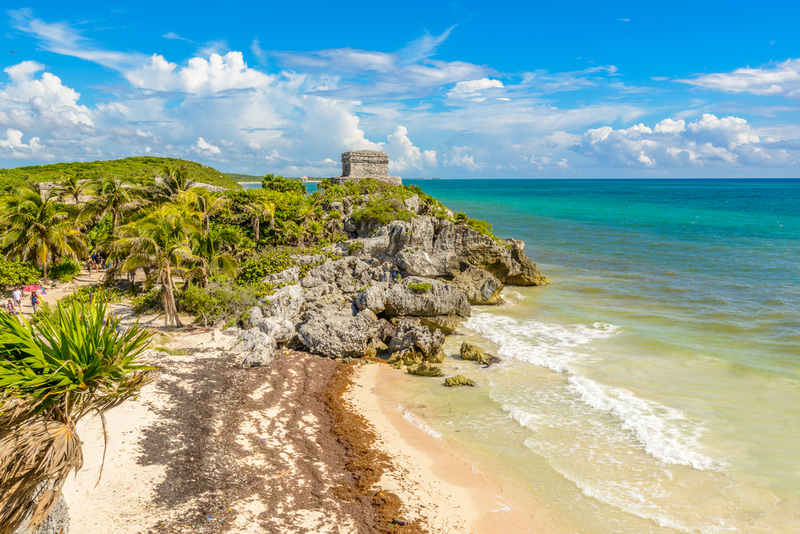 Whether you’re looking for the relaxing island vibes of Tulum, the expat comforts of Puerto Aventuras, the cosmopolitan nightlife of Playa del Carmen, or the secluded beaches of Xpu-Há, the Riviera Maya has you covered. 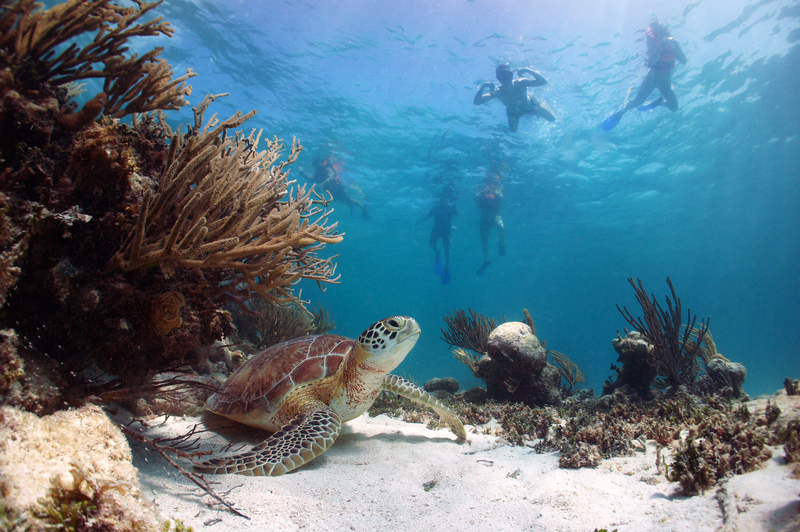 Called ‘Place of The Turtles’ for a reason, Akumal attracts hundreds of feeding and nesting sea turtles each year. Just meters from the palm tree lined beaches, you will encounter a wonderful underwater world full of rays, tropical fish, coral, and of course, graceful green sea turtles. After a morning of swimming, you must check out the town’s ride and joy, La Buena Vida, for some refreshing cocktails and a delicious meal. You can reach this beautiful island directly from Playa del Carmen. The ferry takes only 20 minutes, and costs $163 pesos. 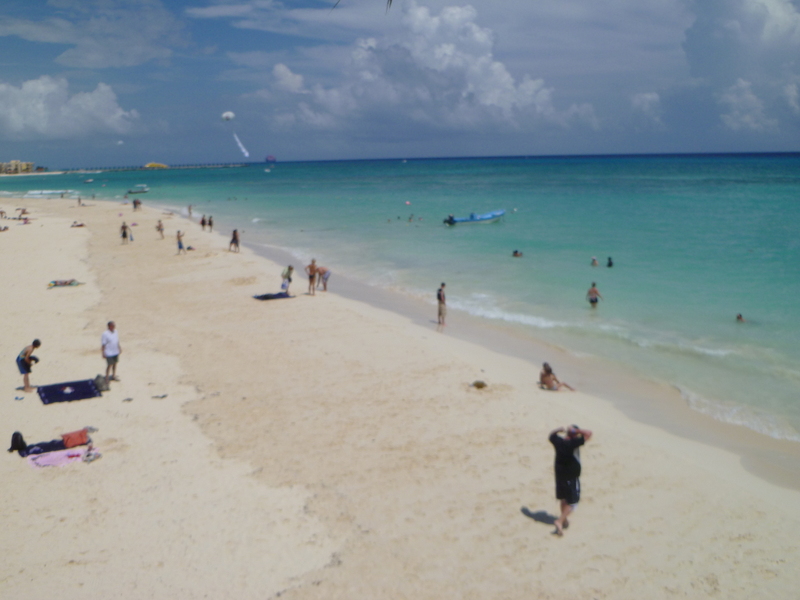 Cozumel is a wonderful mix of bustling island life, virgin beaches and untouched Mexican jungle. You can spend an afternoon shopping and eating in the town centre, hire a scooter and ride around the entire island, jump into the turquoise waters for a snorkel adventure, or sit back and relax on one of the many beautiful beaches. Any trip to the Riviera Maya isn’t complete without a visit to the Mayan Ruins in Tulum. Entrance is only $80, and the views are spectacular. Take a step back in time, and learn about the rich history of the Mayan natives. The amazing pyramids, houses, temples and intricate passageways will give you a true glimpse into how life in Mexico used to be. The most famous street in all of the Riviera Maya is 5th Avenue in Playa del Carmen. This strip is absolutely littered with bustling shops, restaurants and bars. You can find absolutely anything along this famous street, from designer handbags in the new shopping malls, to delicate, handmade souvenirs in the small local stores. 5th Avenue is an eclectic mix of old and new, modern and traditional, high end and handmade, and has a truly infectious energy. The Riviera Maya has many natural wonders, some that you can’t see anywhere else in the world. 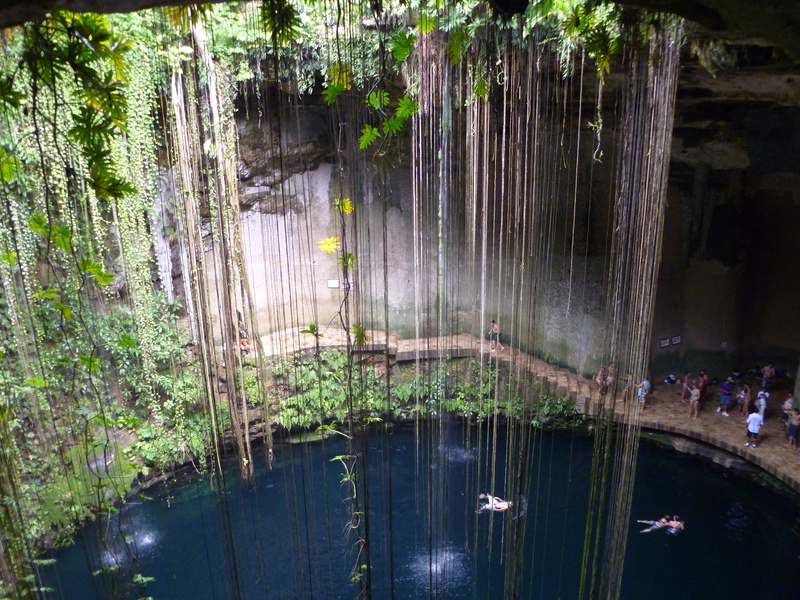 Being on the Yucatan peninsula, this beautiful area is home to many Cenotes. Cenotes are magical bodies of freshwater, scattered throughout the jungle. They are full of unusual fish, stunning rock formations, and are one of the best places to cool off during a hot Mexican afternoon. The Riviera Maya experiences hot, tropical weather all year round. There are usually high levels of humidity, and temperatures can reach a sweltering 32°C in the height of summer. 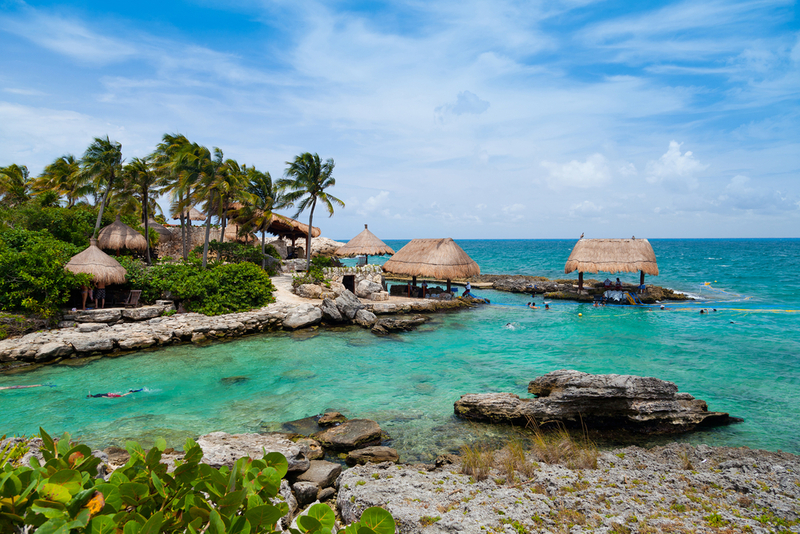 The coolest time to visit the Riviera Maya is during the winter months, November through to February. During this time, the temperature during the day is a comfortable 24°C, and at night drops to a refreshing 14°C. There is a very distinct wet season in the Riviera Maya, which runs from late July to September, with a few showers throughout October. During this period you can experience intense tropical storms and heavy rainfall. Getting around the Riviera Maya couldn’t be easier, or cheaper! Most of the actual towns in the Riviera Maya are small enough to walk or bike around, and all of them have countless rental companies for this. However, if you are visiting one of the larger towns, like Playa del Carmen, Akumal or Tulum, you may want to opt for the local bus or taxi services. Taxis are relatively cheap, and can cost anywhere from $25 pesos for a short trip, to $150 pesos to get from one side of a large town to the other. Buses in the larger towns are frequent, safe and extremely cheap, but not all that comfortable. For $6 pesos a ride, be prepared to get hot, sticky and a little crowded. Travelling between the towns in the Riviera Maya is also very easy. Public vans called Colectivos run along the main highway, past each and every town, every 10 minutes or less. The journey from Playa del Carmen all the way to Tulum takes 50 minutes, but only costs $45 pesos. For a little more comfort, you can also opt for the public coach service, ADO. These buses are large, spacious, and much more professionally run that the Colectivos, but only make stops in Tulum, Playa del Carmen, Puerto Morelos and Cancun. Many people from America and Canada bring USD to the Riviera Maya, and while it is a very developed area, there are many places that see this as a cultural offence, and some small stores that can’t accept it at all. Be sure to bring cash in the form of Mexican Pesos to get the best prices, and to purchase items no matter where you visit. Try not to go to a ‘taxi rank’ in the Riviera Maya. These are unofficial, created by a group of taxi drivers, and cost an absolute fortune. They add on an ‘in-situe’ charge, and also charge you double for the ride. Some taxi drivers may also show you a booklet with prices in, claiming that this is the official rate. These books are more often than not, fake, and created to take advantage of tourists. Be sure to know where you are traveling, and the price you should pay, then stick to it. As the Riviera Maya has a beautiful, warm, tropical climate, it also has mosquitos… a lot of mosquitos. There have been a few mild cases of Dengue and Zika in this area, so be sure to bring a good bug repellent for your trip and apply it at dusk or when in jungle areas. So what are you waiting for? Book your adventure to The Riviera Maya in Mexico and start your South American trip by contacting us now.